A sealed lake is an ideal place to look for clues about extraterrestrial life — and researchers have just identified a few more. Small valley glacier exiting the Devon Island Ice Cap in Canada. The Devon Ice Cap appears to be the only holder of salty subglacial lakes (as far as we know). Image credits: NASA Goddard Space Flight Center. Life on other planets might not be located the most obvious of places. While researchers used to think that Earth-like planets such as Mars or Venus were capable of holding life, modern research has shown that places like Europa or Enceladus are much more likely to be hospitable (Europa and Enceladus are two frozen moons of Jupiter and Saturn respectively). However, astronomers have evidence that beneath the frozen surface lies a vast ocean of liquid where life may very well thrive. Researchers want to explore this avenue before actually landing a shuttle on the surface of these moons (which may take a very long time) and the best way to do that is by studying subglacial lakes. Subglacial lakes are bodies of water perfectly sealed under a glacier — typically an ice cap or ice sheet. There are 400 known subglacial lakes in the world, most of which can be found in Antarctica, with Lake Vostok being probably the most well known. Since they’re sealed off from the rest of the world, life can develop and adapt independently — this essentially means that subglacial lakes are potentially unique microbial habitats which can provide information about how life might have developed on places like Europa. 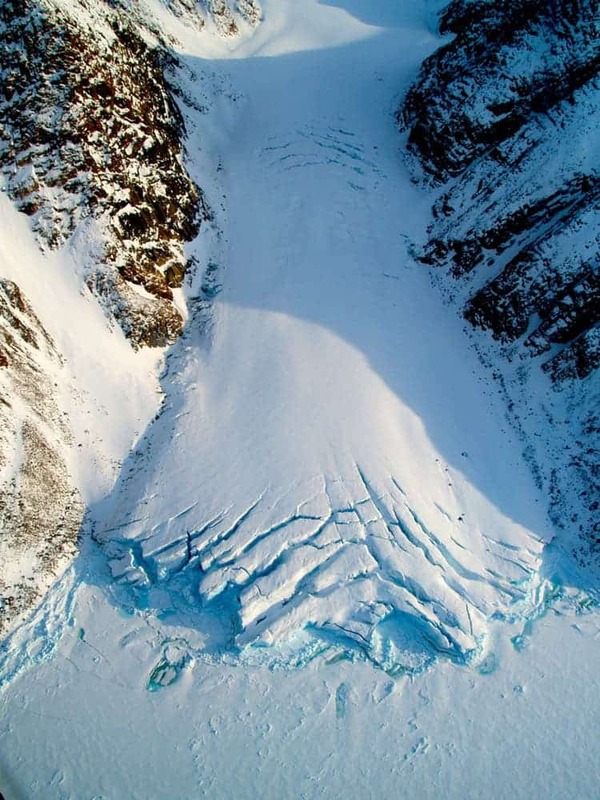 Now, lead author Anja Rutishauser, a Ph.D. student at the University of Alberta, has found the first subglacial lakes in the Canadian High Arctic. 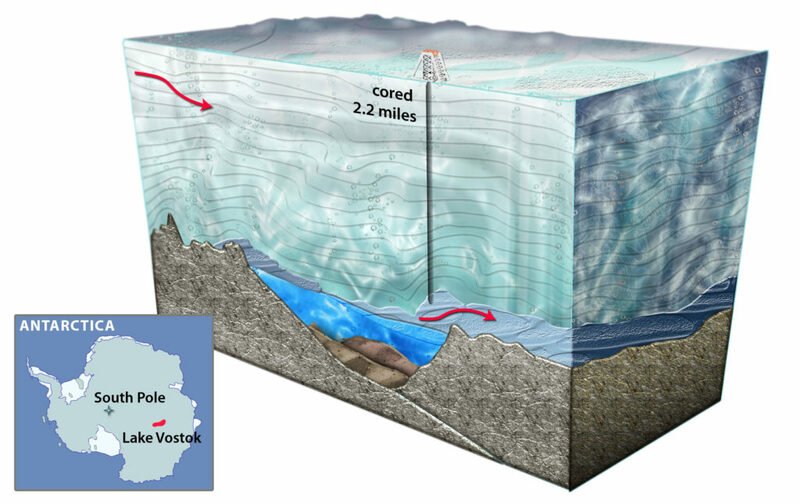 An artist’s cross-section of Lake Vostok, the largest known subglacial lake in Antarctica. Importantly, the lake is sealed by kilometers of ice. Image credits: Nicolle Rager-Fuller / NSF. What makes these newly discovered lakes extra special is that they seem to contain very salty water — all other subglacial lakes we know of are thought to contain freshwater, or only mildly saline water. All subglacial lakes are good analogs for life beyond Earth, but the hypersaline nature of these newly discovered lakes makes them particularly tantalizing analogs for ice-covered moons in our solar system, according to the researchers. There is strong evidence that Jupiter’s icy moon Europa contains hypersaline water. The lake was discovered using remote sensing, which is promising, especially considering that NASA’s Europa Clipper mission, which is set to launch sometime in the 2020s and take samples from Europa, will use similar remote sensing techniques. An analysis of the radar data shows that the lakes are located 550 to 750 meters beneath the Devon Ice Cap, one of the largest ice caps in the Canadian Arctic. They’ve not had contact with the outside world for tens of thousands of years. Now, researchers would like to sample this environment, which is probably more complicated than you’d expect. It’s not just drilling through hundreds of meters (or perhaps even kilometers) of ice that’s problematic: there’s also the matter of contamination — if a unique microbial environment does exist, the last thing you’d want to do is contaminate it.